Weather is always a hot topic in the UK, partly due to its unpredictability. Over the last few years alone, we have seen heat waves in April, floods in the summer and just this year we had snow in March. We may be slightly weather obsessed, but we certainly have good reason. Knowing whether to wear a coat or pack an umbrella may be front of mind for many, but for those working outside, the weather can have a huge impact on operations and productivity on-site. Knowing how to prepare for any eventuality, when working outdoors, is therefore key and it needn’t be as tricky as first thought. The obvious protection for a variety of outdoor working environments is the use of layering. A standard T-shirt or even thermals can be worn beneath jackets or body warmers for extra comfort and warmth. Before purchasing, consider what products are made of and try to opt for breathable materials. Cotton is great, so too are certain wicking polyesters so try to opt for a mix of both in under layers. On top, fleece items are ideal as they remain warm, even when wet and are also light and quick to dry. While safety footwear specification shouldn’t change through the seasons, there are several things to consider. When it comes to socks, thicker socks don’t necessarily mean that they will be warmer, and you also need to consider whether your boots will still fit. The principle of layering up also stands, go for thinner socks ideally made of moisture wicking materials such as merino wool and polyester. These will help to prevent your feet getting too hot and sweaty through the warmer months and too warm during the winter. If the weather does take a turn for the worst, it’s not only you and your clothes that need to be dried out properly, remember your footwear too. Damp leather, in-soles and inners aren’t comfortable to wear and will make you feel cold onsite. They are also more prone to mould and cracking – reducing their life expectancy. If really wet inside, scrunch up some newspaper and push into your boots/shoes to absorb the excess moisture, then allow to dry naturally. One of the biggest causes of boot and shoe laces breaking is them not being maintained correctly – if they get wet, remove them and dry them completely before re-lacing. Mould, mud and water will degrade the fabric overtime, leading to them breaking and snapping. When the sun is shining, we may all reach for the sunglasses but check yours meet the required standards for your working environment. No matter what time of the year, sunglasses and protective eyewear is key – just remember to check the suitability for your job. Amber lenses for example tend to be used indoors, whereas grey lenses help reduce excessive glare. Other features to look out for include a curved lens style which will fit many facial shapes and sizes. Also consider comfort features and flexibility especially in the temple material and design. Above all be sure they will protect your eyes and meet the company health and safety requirements. When the sun begins to shine, it’s all too tempting to remove clothing items and hard hats to keep cool, risking your own safety. On the opposite end of the scale, during the winter months, some workers may be tempted to wear a wooly hat, either in place of the hard hat or beneath it. This can be risky too, particularly if the hard hat does not fit properly as a result and thereby jeopardising safety. Whereas, during the summer months, consider the protection the hard hat is providing against the sun’s rays. 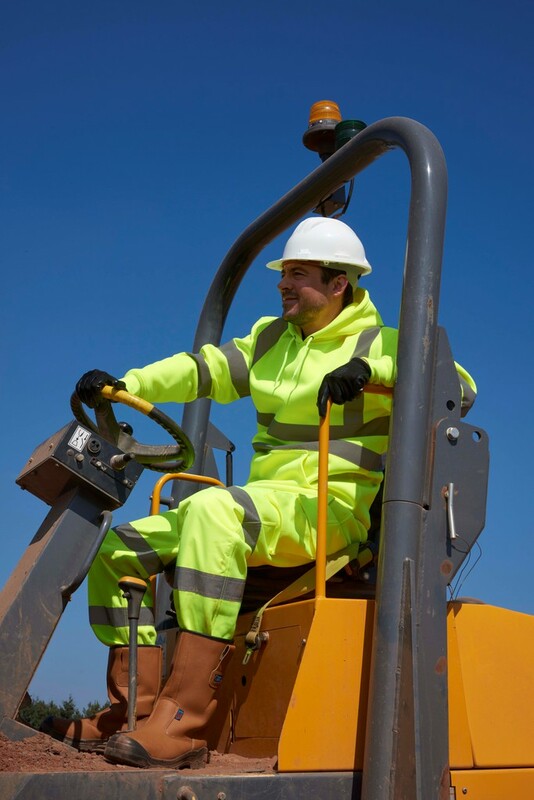 Safety wear is an important consideration in any weather, but the focus often seems to be on either the harsh winters or boiling hot summers. The reality however is that British weather is changeable, and we therefore need to be prepared no matter what comes our way – be it rain or shine.